Trees don't exactly have four legs to go roaming around on but somehow despite what conservationists and governments do to stop illegal logging they still manage to disappear from their century long resting ground. Old growth forests may no longer be at risk from kidnappers if a bunch of British designers have their way. Helveta, a technology firm based in Oxford has created a system to track trees. It involves a barcode system not too different from what many shops use to keep control of their stock. The ultimate idea is for customers all over the world to be able to track where the wood to make their furniture, building frames, home wares and other woody items came from. It basically gives the end consumer a security check for proclaimed ‘sustainable' products. One of the first projects to utilise tree barcoding will be undertaken in Liberia - a country with a long history of illegal logging. 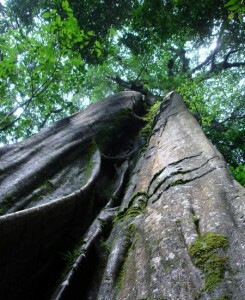 The goal will be to barcode all 90 metre plus trees in Liberia's 4.3 hectares of rainforest. The trees will be tagged with a unique identity number. Once cut down the stump will be tagged with the same number. All the barcodes will be kept on record in a huge database in Reading. If a customer asks where the wood was sourced, the retailer has to simply visit the online database, type in the identity number of the product and voila they'll know if it came from Brazil or Indonesia. Legislation is also being put through in Europe and the EU to ensure retailers buy only legal timber - they must prove where the wood in their products has been sourced. Of course the more we buy products made from recycled wood products, such as recycled stationary or furniture made from reclaimed timber, the few trees have to be cut down at all.